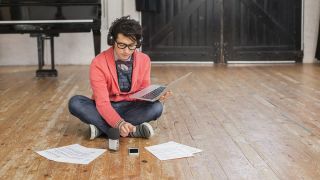 You don't need to know anything about music to cheerfully bang out choons on your Mac or PC, but understanding the basics of scales, chords and all the rest of it can only be a good thing, obviously. If even learning the fundamentals of music theory sounds too much like hard work, though, you can still get an instant leg up with our octet of quick-fire tips and tricks - foolproof techniques that will help keep your tracks in key. For much more on music theory, check out the October edition of Computer Music (CM234). If scale modes are scary, then chord modes must be truly trouser-soiling stuff, right? Thankfully not - chord mode or memory is the name of a classic synth feature, whereby a chord is triggered with one key. In traditional implementations, the chord is simply transposed up and down, so it doesn't stay diatonic (in key). However, it's a sound that's featured in countless dance and rave tracks, proving that music theory rules are there for the breaking! To achieve it, use a synth with a chord memory (eg, AudioRealism's Redominator), duplicate or transpose a MIDI chord, or use a chord sample in a sampler. Building chords and using scales can seem more like a brutal maths exercise at times - so why not get your computer to do the hard work? Computer Music's new B-Step CM plugin, for example, makes it easy to try riffs based on chord sequences. Xfer Records' Cthulhu is another fine option for exploring progressions. Cubase's Chord Track and Chord Assistant can even tell you what chords ought to come next! Ableton Live isn't quite that smart, but its MIDI Effects make it easy to stay in key and generate instant chords. Many other DAWs feature similar MIDI plugins, and other software, such as Autotheory and AutoTonic, sits between your MIDI keyboard and DAW to keep your noodlings strickly diatonic. RapidComposer, Cognitone Synfire and WaveDNA Liquid Music can even help with the composition process. As well as referring to the notes and chords of a scale as numbers 1-7, or using the Roman numeral naming system, there's another terminology for describing the notes - aka degrees - of a scale, and the chords built on them. For a major scale, they're called Tonic, Supertonic, Mediant, Subdominant, Dominant, Submediant and Leading Tone. The minor scale uses Subtonic instead of Leading Tone. the second most important besides the Tonic (1st), while the Leading Tone (7th) leads nicely back to the Tonic (1st). Knowing how to lift weights and what to eat for optimal strength won't make you strong, and it's the same deal with music theory: you need to put it into practice and train your ear to get the best results. As an exercise, try recreating a favourite song in your DAW - see how close you can get the notes and chords. Or render notes, intervals, scales and chords as MP3s, then put them in playlists on shuffle. Try to identify or match them on your MIDI keyboard. Don't expect to identify specific notes by ear, though - that's perfect pitch, and it's very rare! One of the absolute best things you can do with music theory knowledge is… forget all about it! Yep, ditch all the rules and regulations and just get on with making music. With even a basic understanding of theory, you'll find that things come together more naturally, even if you're not thinking about specific chords and scales while writing. And when you do get stuck, or you can't quite get that melody to gel with the chords? That's when you apply music theory, to get the creative process rolling again. \When you first get familiar with modes and scales, you may feel the urge to stay locked into the "right" notes for the whole song, to maximise the effect. After all, any deviation could leave you in a sort of musical no-man's land that's neither one scale nor the other! Couldn't it…? Nah, not really - songwriters move between modes and scales all the time. This can either be done in a 'passing' sense, such as brief connecting chords or notes (semitone steps work well). Or it could be as extreme as writing a melody that outlines a new key with each chord. Don't be afraid to take off the harmonic stabilisers and wander into a different scale if it feels right. No one key is musically superior, but there are reasons for choosing one over another. First, some musical instruments are easier to play in certain keys. And some can only play specific keys, such as the harmonica or harp. Vocalists may find a given song easier to sing if it's transposed to a higher or lower key, to move it into their comfortable range. Electronic musicians don't have playability worries, but the key used will determine the frequencies of the main notes in a song. Many dance tracks are in keys F to A (major or minor), so that when the bass plays the first note of the scale, it's in the optimal sub bass range, 45-55Hz. Want to create a harmony for your lead line? A simple approach is to duplicate the line and move it up or down a perfect fifth or perfect fourth. This basically ensures a diatonic (that means 'in key') result. The only exceptions would be things like adding a perfect fifth on top of the 7th note in a major key, which should be a diminished fifth. In practice, though, it's often either left as-is, moved to a different in-key note, or avoided altogether. For even sweeter harmonies, stack in thirds instead. It's just like building notes into triads, but using a Root-3 formula rather than Root-3-5. Make sure the harmony notes are in key - you'll end up with a mixture of minor and major third intervals.